Market Rasen Air Cadets have a new sports kit and an extra £200 in the bank, thanks to the town’s Round Table members. The donations were made as a ‘thank you’ for the hard work the cadets put in at the Round Table’s annual bonfire last November. Cadets from 2292 (Market Rasen) Sqn RAF Air Cadets were on hand to help with car parking, security on the crowd-line and even ended up helping to serve burgers. The Round Table were really appreciative of what the cadets did. Chairman of Market Rasen Round Table, Richard Cameron went along to make the presentation to the cadets, commenting on how professional they had been and their flexibility to do whatever needed doing. The sports kit incorporates a new crest,pictured below, which Flt Lt Mike Eckersley (Officer Commanding 2292 Sqn) explained. 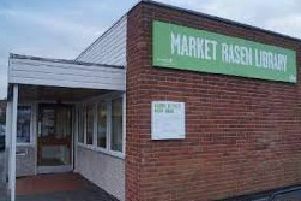 He said: “The green and white background is taken from the Market Rasen Coat of Arms, whilst the blue lion comes from the crest of RAF Binbrook, which was in Market Rasen. “The winged bomb is from the centre of the Bomber Command crest and represents Lincolnshire – or ‘Bomber County’. The Round Table is for men aged 18-45. They meet every other Monday night to take part in a range of interesting activities, followed by a meal, and anyone interested in finding out more can contact Richard on 07985 481111.